Musicals usually face obstacles on their way to Broadway — production costs, last-minute changes and, of course, theater critics. It’s not often that homicide is counted among these roadblocks. This is the scenario imagined by “Curtains,” which premiered in Los Angeles in 2006 with music by John Kander and Fred Ebb and a book by Rupert Holmes. The musical satirizes the fickle and occasionally cutthroat nature of show business, ultimately coming to the conclusion that theater, and art in general, is worth all of the trouble. 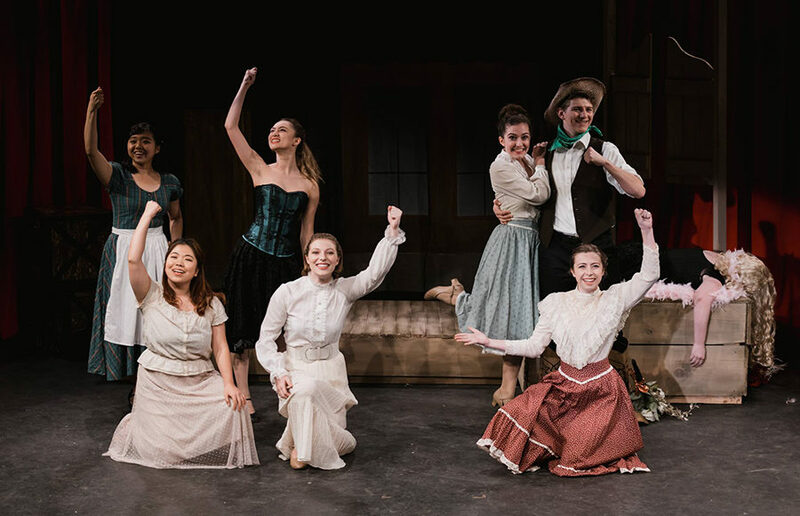 BareStage Productions’ interpretation of “Curtains,” directed by Ethan Glasman, supports this conclusion with a vocally skilled, comedic cast proving that it’s talented enough to (almost) get away with murder. 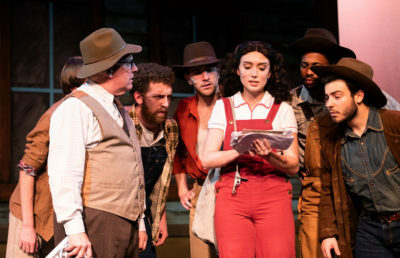 “Curtains” takes place in Boston during the 1950s and follows a fictional production of “Robbin’ Hood of the Old West” as the cast and production team struggle to transfer the show to Broadway. When the musical’s leading lady is murdered on opening night, police lieutenant — and closeted theater lover — Frank Cioffi (Jackson Paddock) must work with the cast and crew of the production in order to figure out who among them is the murderer. It’s a campy, old-fashioned premise and one that BareStage’s cast doesn’t take too seriously. The “show within a show” structure means that the musical is littered with skillfully executed fourth-wall breaks: actors dance in the aisles, lighting cues are announced by the characters onstage and many of the actors’ quips are accompanied by deliberate glances at the audience. 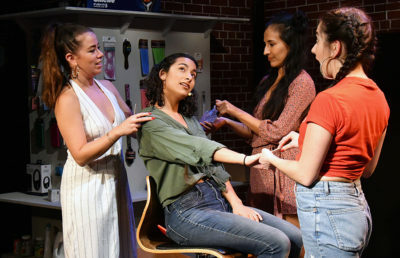 In addition to Niki and Frank — whose graceless flirting provides the show with numerous instances of comedic gold — Keila Cone-Uemura showcases some of the best comedic timing in the show as cynical producer Carmen Bernstein. Cone-Uemura chews her scenery with gusto, and her numerous eye-rolls to the audience about topics such as her husband’s sexual ineptitude and her daughter’s lack of talent are hilariously notable moments in a musical chock full of gags. The show’s choreography is mostly by-the-numbers, with jazz squares and chorus lines making appearances fitting for the show’s 1950s setting. An energetic change to this pattern, though, arrives during “Robbin’ Hood” number “Kansasland,” where cast member Bambi Bernét (Jillian Smith) twists and flips her way through a sultry dance break with some assistance from her partner, Bobby Pepper (Edward Stafford). For all of its dance breaks, vocal harmonies and jokes — and it has a lot of these things — “Curtains” is still a murder mystery. And though the solution to the crime seems to come entirely out of left field, that seems to be the whole point of the exercise. “Curtains” places its audience in a world where discovering the correct arrangement of a song is more important than catching a killer. Yes, it’s ridiculous, but, as the characters in the musical remind the audience, that’s show business. And for the most part, the cast and crew of BareStage prove that this business is still very much worthwhile.